0/6 Months - £23.99 6/12 Months - £23.99 12/18 Months - £24.99 Only 3 left! Alright, shut it down. Shut the whole Internet down. We cannot handle this level of cute going on! It's too much! Adorable cats? Sure, we can do it. Dogs seeing their owners after months apart? Yeah, we definitely get a little teary-eyed. 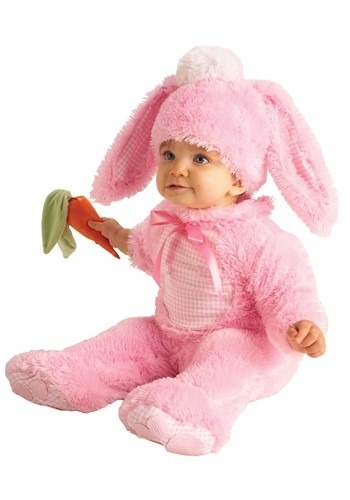 But this Pink Bunny baby? Come on! It's not even fair! All we want to do is cuddle da widdle baby- See! We're even slipping into baby talk looking at this costume. So we get it, you want your baby being the most adorable, cutest little sweetheart out there on Easter morning. Well, mission accomplished, parents! You've found the way. And it even comes with a little carrot rattle. Look, here's the thing: we know it's not about the baby. Maybe your kid likes the costume, but maybe after five minutes they go nuts and want to wear anything but an adorable bunny. That's fine. You've already got your pictures. And the pictures are what matter. Why? Because they create a lifetime of memories of when your little one was at the perfect age to be the very cutest bunny ever seen. And why else? Because you get to rub those pictures in everybody's faces, that's why! Yeah, they're going on Facebook. Yeah, they're going on Instagram. Yeah, they're going into a personalized calendar full of 12 adorable pictures of your baby to share with all your relatives. People need to see how cute your kid is. They need to understand that even if they have babies themselves, those babies aren't nearly as perfect and wonderful as your own brood. You have to out-cute everyone. This is the first step, parent. Good luck! One of the hardest things to do on Easter morning is to find all the eggs that the Easter Bunny has left behind. That little critter is super sneaky at finding just the right place to place those colorful eggs. You could try to bribe this rabbit into telling where he hid those tasty treasures but more than likely he'll just scamper away. Because you can't bribe that rabbit, he already has everything he wants!